Must be kept in shoals of 6 or more. Can be kept with other peaceful fish but do not keep with fin nippers or predatory fish. Will take most foods including pellets and flake as well as live/frozen foods such as brine shrimp and daphnia. Bleeding Heart Tetras prefer a well lit tank with dense planting with some open swimming space. Prefers soft water, and will thrive with peat filtration. A peaceful shoaling fish. Sensitive to water conditions and prone to diseases such as Ich. A small disk shaped Tetra similar to that of the Black Widow Tetra. Body colour is pale, mostly silver-white and red hints with a small red spot on either side of the flanks just behind the gills giving this fish its common name. They upper half of the eyes are also red, the fins are generally translucent except for the dorsal which is tipped with black and yellow. 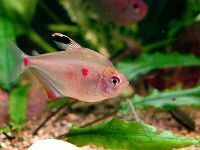 Can be mistaken for the Hyphessobrycon socolofi or Lesser Bleeding Heart Tetra.